Origin and Habitat: TL: 10 km W of Luckhoff, South Africa. 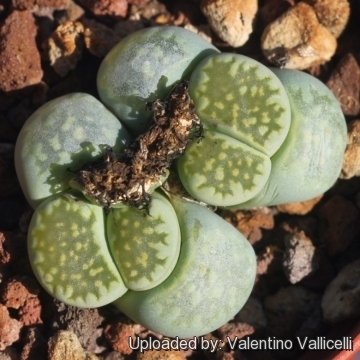 Description: Lithops salicola C351 TL: 10 km W of Luckhoff, South Africa cv. Malachite is a lovely form of Lithops salicola. It shows a very peculiar green colouration. Lithops salicola L. Bolus: clumps up quickly and forms matted groups with up to 50 heads. It grows on salt pans, with little or no stone, where they are often partly submerged during the rainy season. Lithops salicola C034 TL: 10 km NW of Luckhoff, South Africa: jagged windows, blue-grey. Lithops salicola C037 40 km SE of Hopetown, South Africa: grey, broad jagged windows. Lithops salicola C049 TL: 15 km N of Hopetown, South Africa: large grey jagged window. Lithops salicola C086 (maculate Form) 35 km SE of Hopetown, South Africa: large windows, striking . Lithops salicola C320 10 km WNW of Luckhoff, South Africa: eraser-grey. Lithops salicola C321 25 km WNW of Petrusville, South Africa: greyish blue. Lithops salicola C322 20 km SW of Luckhoff, South Africa: clay colored. Lithops salicola C351 10 km W of Luckhoff, South Africa: tiny marginal rubrications. Lithops salicola C351 TL: 10 km W of Luckhoff, South Africa cv. Malachite D.T.Cole: lovely green form. Lithops salicola C353 15 km WNW of Luckhoff, South Africa: slate grey, finely netted dark lines. Lithops salicola var. reticulata de Boer: a hybrid population between Lithops salicola and Lithops hallii. Lithops salicola cv. Bacchus: face is deep red wine colored. 13) Edgar Lamb (1978) "The illustrated reference on cacti and other succulents" Blandford Press. Cultivation and Propagation: Lithops salicola is one of the easiest species that will stand cold winter conditions if dry. Some people consider it one of the most tolerant of overwatering. It is not infrequent that seedlings grow up spontaneously in the potting container at the base of the mother plant. In hot weather, it becomes semidormant. This plant clumps up quickly and it is often seen in large mounds at shows because it is relatively easy to manage like that where many other species would quickly kill themselves. 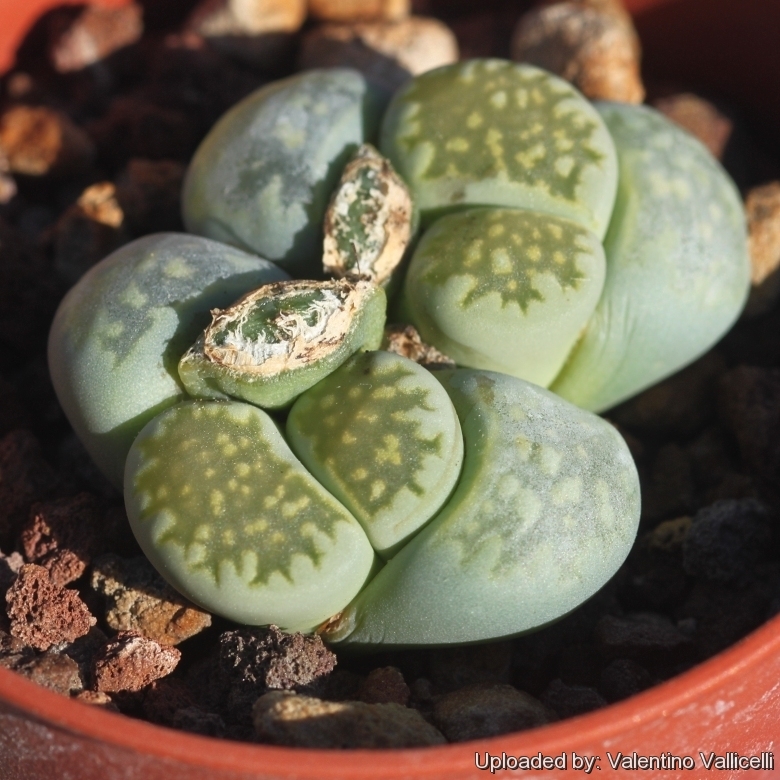 In general the Lithops are some of the world's most fascinating plants sought by succulent plants collector. Paying attention to the particular growing requirement of Lithops is especially important. If you provide the Lithops with the right conditions, they will reward you with their unique shape, size, colour and a proliferation of blooms in autumn. However, Lithops are tricky plants that are very particular about their growing conditions and require the right maintenance in order to keep happy. But don't be afraid even the best growers have plants that mysteriously dry up, or leave during the night. While Lithops are picky about their care, if you are patient and remember the basics, your efforts will be rewarded. Being small plants, a representative collection can be grown on a patio table, a sunny windowsill or a shelf in the greenhouse. - Red spiders: Red spiders may be effectively rubbed up by misting the vulnerable plants every day. - Mealy bugs: Occasianlly mealy bugs develop aerial into the new leaves and flowers with disfiguring results, but the worst types develop underground on the roots and are invisible except by their effects. - Scales, thrips and aphids: This insects are rarely a problem. - Rot: Rot is only a minor problem with mesembs if the plants are watered and “aired” correctly. If they are not, fungicides won't help all that much.